This is Book 1 in an exciting new series called So Say the Waiters. Justin Sirois digs into the growing market of social media and mobile apps to bring an interesting new series to readers. The story mainly takes place in Baltimore and follows two main characters Dani and Henry. Their story lines are separate, but as I had been assuming since beginning the book, they end up crossing paths along the way. Henry is a program developer that has recently gone through a divorce, and he is just trying to get through. His job is enough for him, but the payments on his house and mortgage are getting out of hand. As he tries to get over his recent divorce, he begins calling in to work more often than not. When his good friend from college calls him up and flies him out to California for a weekend, he is given an offer that he cannot refuse – no matter how much he may want to. Dani is a single girl covered in tattoos and works as a bar tender at a local club. She is good at her job, but struggles to make rent. She lives with her friend Bonnie, and though they don’t get along all of the time, the arrangement is good enough for them – at the beginning. She is covered in tattoos, none of which have a great amount of meaning to her, don’t ask her what they mean, and ESPECIALLY don’t call her a hipster. To me, Dani was the more interesting character of the two. For a good majority of the book, Henry was a bit whiny, but that is his character. He has gone through a rough patch in life, but is working on turning it around. About midway through we are introduced to two other character, Jess and Uly. They are brother and sister and Jess is about four years older. They are interesting characters, but for the longest time, I could not figure out what part they had to play in the story. It becomes a bit clearer as the story progresses, but I hope to see a bit more of them in Book 2. Now to what ties all of these characters together and what this book is really about. 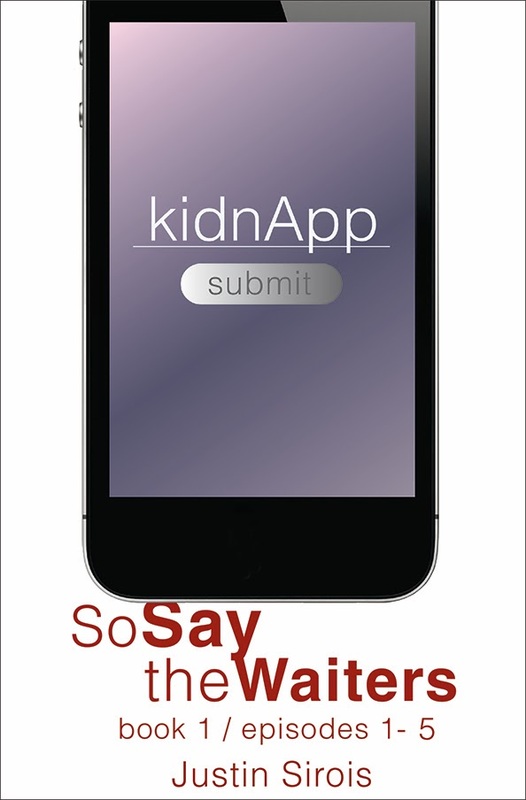 kidnApp. It is a new mobile app that was created by Henry’s college friend Steven. 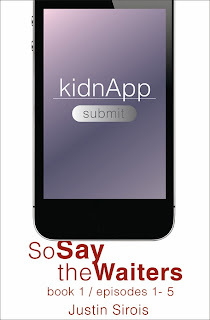 This app allows the “waiters” to submit an application to be kidnapped by hired “takers”. The takers are hired by the company and are professionals who are there to fulfill all of the waiters wishes for their kidnapping experience. Once the kidnap is done, the takers return the waiters to their homes. In the app itself, it allows waiters to write about their experiences and to connect with other waiters. It is a very interesting concept, but it could go horribly wrong. This book is written very well. Justin Sirois writes in a way that captures your attention from the very first page. The chapters are fairly short, and there are also breaks in each chapter if you need to put the book down to take a break. The characters all have their own stories, and they all grow as the story progresses. None of them felt like unnecessary characters. They were all important to the book, and they were all relatable in their own ways. 5/5 stars. Perfect set up for a series. Interesting storyline with great characters and character development.